Tim has been woodcarving since 1998. 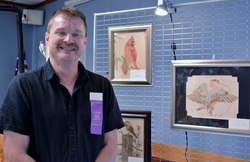 He has been a professional artist since 2005. 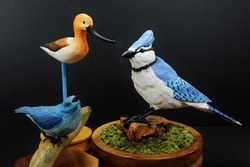 Tim's love of birds has caused him to recreate them in wood. He finds the beauty and elegance of birds to be a part of natures' magical wonder. One of his favorite past times is going out into the woods with his binoculars and observing them in their natural habitat. Tim has won numerous awards for his sculptures though out the northeast. Tim will create a custom sculpture for you; email him and let him know what your interest is.